Throughout his great entertainment career, Bob Hope (1903 to 2003) exemplified love and pride of America through hIs unyielding and tireless support of the troops over 6 amazing decades . . . including performances on the front lines of harm's way from World War II to Desert Storm . . . setting the standard for those noble American celebrities who have gallantly followed his patriotic trail. And it was never about self when doing so! Bob Hope will always remain a Great American Patriot who earned the respect and love of several American generations . . . 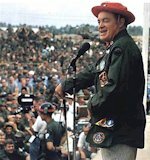 Here are a few highlights of Bob Hope as the USO's "Ambassador of Good Will" which he headlined approximately 60 tours. His first performance for service members was at March Field, California, May 6, 1941. His first combat zone USO tour in 1943 was visiting U.S. forces in North Africa, Italy and Sicily. The first Bob Hope Christmas USO tour was in 1948, performing for the GIs who participated in the Berlin Airlift. The Bob Hope Christmas USO tour became a USO tradition, and he visited military bases and veterans' hospitals every December for the next 34 years. In 1969, President Lyndon Johnson bestowed the Presidential Medal of Freedom upon Bob Hope for his service to the men and women of the armed forces through the USO. Bob Hope made his final USO tour in December 1990, bringing Christmas cheer to troops participating in Operation Desert Shield in Saudi Arabia and Bahrain. In 1997, the USO successfully worked with Congress to designate Bob Hope the first honorary veteran of the U.S. armed forces. At the 1997 USO Holiday Gala, the USO unveiled the "Spirit of Hope" Award. It is a portrait bas-relief of Bob Hope, created by St. Louis sculptor Don F. Wiegand and Michael Fagin a major donor to the USO.